The Iron Bowl probably just got a little more interesting. It has come to our attention of a movement/group called “Flag The SEC Refs At The Iron Bowl” that has started up on Facebook (click here to go to the profile page). The group stands at 1,065 members strong and growing as of this posting. The idea was hatched by Auburn students and is being led by the Orange Jump Suit Guys (featured on this site earlier last month). Their plan? 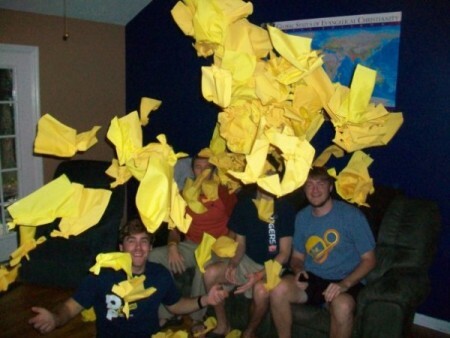 To hand out yellow flags to the entire Auburn student section and throw them in concert during questionable calls at the Iron Bowl. In order for this to happen without us looking like a ragtag group of drunken redneck idiots, several things must be done. First, under no circumstances should any flags be thrown on the field or towards a player/official. That is low class, and not what Auburn or this group is about. Second, this needs to be a coordinated action, with all the students acting as one, not throwing flags up at random. The flags will (most likely) be thrown only 1-3 times in the game. We do not believe Auburn never deserves a penalty, and that every call is bad. To ensure this takes place, we will be following the lead of the “Orange Jumpsuit Guys” who sit in section 28 (for more info, see http://www.facebook.com/search/?q=orange+jumpsuit+guys&init=quick#/pages/The-College-Kids-Tailgate/135874156066?ref=sgm) . When a flag goes on the field and you think it may be questionable, turn to look at section 28. If you see the Orange Jumpsuit Guys raise and lower their flags twice, releasing them to the air on the third time, join with them. If not, DO NOT throw your flag, you’ll make us all look disorganized and dumb. Even if you don’t agree with the Jumpsuit Guys decision, please respect it due to the national stage we are on. Whew. That’s going to be tough to do. Hand out a bunch of flags and they’ll probably fly at random times. And I’ve gotta tell you: There will be drunken idiots wearing orange and blue in the student section. There are drunken idiots in EVERY student section. But I ‘d bet it would be possible to get it together. Since I am a not a student, it doesn’t really matter what I think. But I have to wonder how it helps our Tigers. Is referee retaliation in any way possible?